Some people looked for the artwork ‘List’ and failed to find it. Some people found it but failed to recognize it as an artwork. I quote the following to help me validate the uncertainty. “If the viewer knows at first sight he is face to face with an artwork, the dialogue with its setting (in this case, the RHA exhibition), and the suspense this engenders, disappears”. Viewing conditions were not ideal. 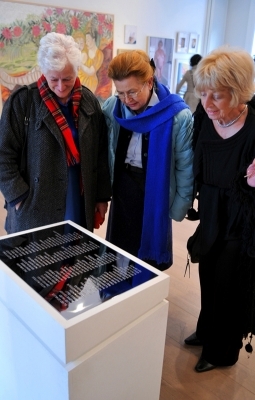 List was shown in the ‘Friends Room’, a space not designed for exhibiting artworks. Some pieces, including List, were moved around to facilitate other activities during the exhibition. I wish I had thought of that myself – to move the work everyday to different locations within the gallery – the resulting confusion might have contributed purposefully to an object intentionally ambiguous and depending on context for its effect. List proved to be irresistibly touchable and I made regular trips to the gallery to clean fingerprints from the chromed surface. During these visits people sometimes asked what List was about and I would try to answer. The thematic logic of the ‘Friends Room’ appeared to be based on portraiture, someone had decided List was a portrait, which was fair enough.